The landscape painting of a pretty porch with wicker furniture overlooking a bay is in the home stretch. To finish this original oil painting I need to continue adding the details to the flowers and the chairs. After that I will adjust any areas that will help the overall mood of the painting. I would like to sit in one of the wicker chairs and view the bay myself. This scene welcomes you to sit and rest in this beautiful spot up high over the ocean. I hope the viewer feels the same way I do and would like to take a seat and put your feet up and take a much needed rest. 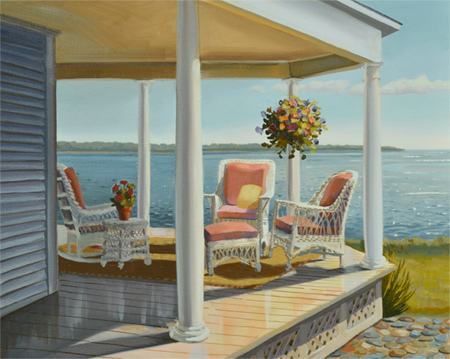 In the home stretch for this landscape painting of a porch overlooking the ocean. This original landscape painting is 16″ x 20″ on canvas and includes a nice gold wood frame. Send a message below or use the contact page to send any questions about this painting. Thanks.